LP and Little Man spend pretty much all their time together – apart from when they are at school. I think it’s down to LP that Little Man has such an interest in books, learning words, writing and counting – she practices these things constantly at home and it’s rubbing off on Little Man bit by bit. But one thing both LP and Little Man love is to read together – with Little Man choosing a book and LP reading it to him, him listening intently as they work through the book together. LP is Little Man’s favourite person and when she reads he hangs on to her every word. It’s so lovely to watch and even lovelier for them to experience. LP is zooming up the reading levels at the moment. It’s something that has just clicked for her and it’s something that she really enjoys too. There aren’t many times that we catch her without a book in her hands and I love the enthusiasm she has for reading, the joy it gives her and how she even puts books under her pillow when she sleeps. But, more than that I love that reading is something LP and Little Man can share. Cuddled up on the sofa or in bed in the evening, reading a book together or, sometimes, asking Hubby or I to read one to them. They love to read and they love to read together. They sound like such a lovely pair and you can tell they’re so close, the way they sit together. What a wonderful older sister and mentor. I love watching z read too and adore how he likes to get lost in a book! Oh Donna this is an adorable shot. You can tell Little Man is holding on to LP’s every word. I’m really looking forward to my A reading to Arlo, it looks so lovely! How precious they are sharing the joy of books together. 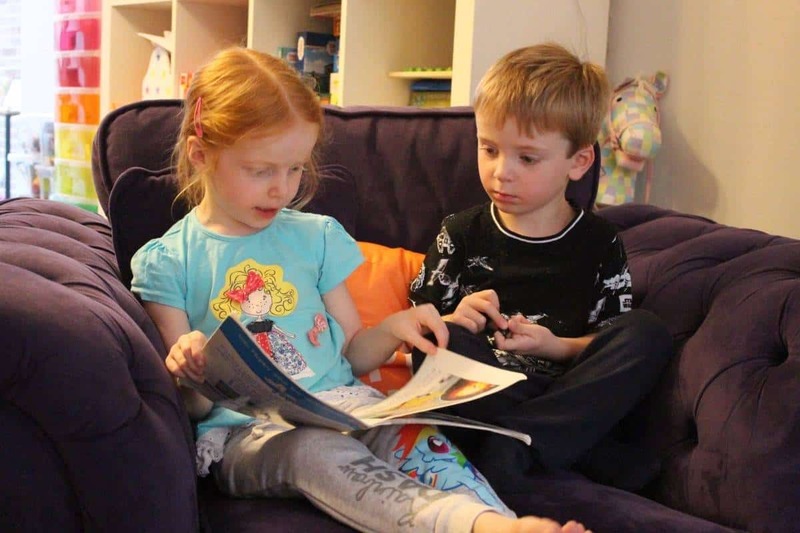 I think it’s absolutely adorable that your daughter reads to her brother and it’s great that she’s enjoying reading and doing so well at it too. Such a lovely thing to share and have a passion for, I love to see my two share reading and it definitely rubs off on one another doesn’t it?